On November 7, remote electronic sensors triggered an alarm indicating that something was violating site security. Underground, in the launch control area, two officers noted the signal, but there was no television surveillance topside. The normal procedure for detecting what had violated security was to call for a missile security helicopter to check the area. At the same time, Sabotage Alert Teams (SAT), consisting of four to six men, were also alerted to the fact that a violation was taking place and were ordered to proceed to the site. On this occasion, an SAT team drove down the highway and onto a dirt road which led to the K-7 area. About a mile away, the team could see an orange, glowing object over the area. As they closed to within half a mile, they could now see that the object was tremendous in size. They radioed to the Launch Control Facility that, from their location, they were viewing a brightly glowing, orange, football field-sized disc that illuminated the missile site. The SAT team was ordered by the launch control people to proceed into the K-7 site. However, they responded that they refused to go any farther, clearly fearful of the intimidating appearance of the object. It began to rise, and at about 1,000 feet, NORAD picked up the UFO on radar. 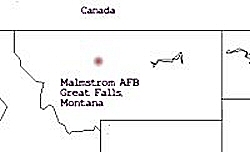 Two F-106 jet interceptors were launched from Great Falls, Montana, and headed toward the K-7 area. The UFO continued to rise. At about 200,000 feet*, it disappeared from NORAD's radar. The F-106's were never able to get a visual sighting of the UFO. Source: A Strange Harvest; reprinted in Clear Intent, 28.